Dressed in this Bacon Bunting, your baby will be a hot commodity! Studies show that the only thing more popular than babies is bacon. Combining the two means you're sure to compliments on your little one's funny costume choice. Even if infants are not old enough to eat it, introducing them to joys of fried meat at a young age can only benefit them in the future. If you wear our Bacon Suit or Bacon Dress, you'll be a tasty breakfast combo that can't be beat. 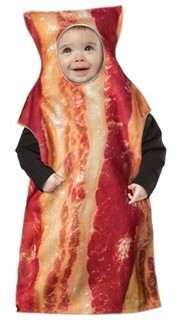 Availability: The Baby Bacon Costume ships in approximately 1 business day.